This is the best Key Lime Pie Recipe ever! 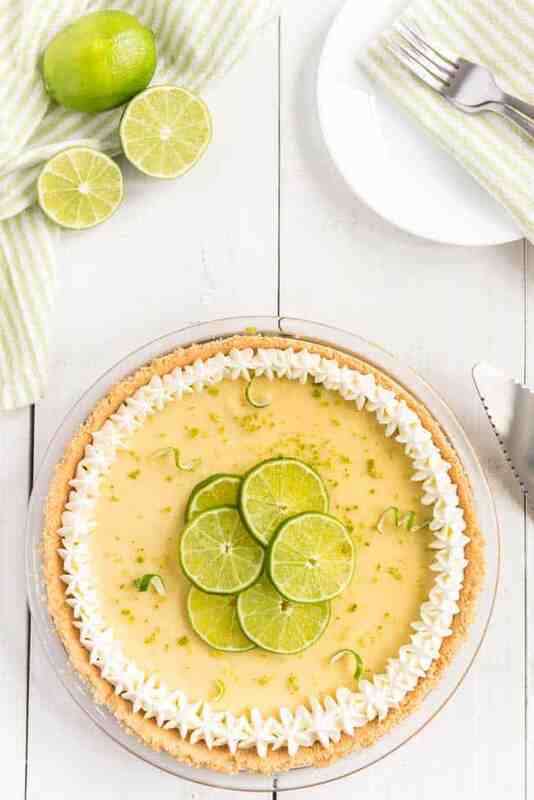 With only 5 ingredients is also the easiest Key Lime Pie recipe we’ve ever tried. 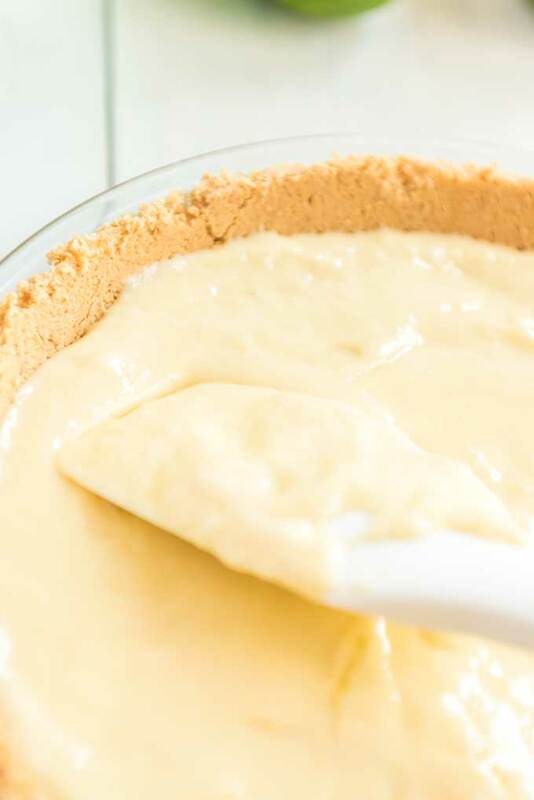 This old fashioned no-bake Key Lime Pie recipe was passed down to me from my great grandmother and I know you won’t be able to have just one slice! This past weekend I started digging through my old recipes and found my grandmother’s Best Key Lime Pie recipe. As soon as I saw it I knew I had to make it-who doesn’t want key lime pie in the middle of the scorching summer heat?? This is an old school, no-bake key lime pie recipe, tart and sweet and perfect with a dollop of whipped cream. Recipe originally published July 2015 and updated March 2019. Full printable recipe at bottom of blog post! 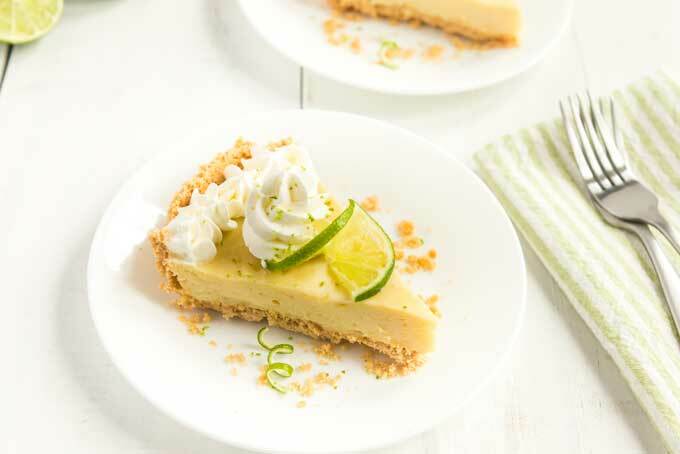 This key lime pie is super easy to make. Using a premade crust instead of a homemade graham cracker crust also makes it fast! It also helps to use a bottled key lime juice rather than squeezing your own fresh lime juice. Bottled key lime juice can be found in grocery stores in either the juice section or in the produce section. To start, dissolve the gelatin and lime juice over low heat in a small saucepan, then set aside to cool. Next, you will beat the egg yolks until they are a pale lemon color, then add the sugar and continue to mix until blended. Add condensed milk and mix well being sure to scrape the bottom and sides of the bowl. In a separate medium bowl, you will beat the egg whites and sugar until stiff peaks form. Then you simply fold together the two egg mixtures and lime mixture and pour into pie crust. Refrigerate at least 4 hours and serve chilled with whipped cream and let that tangy taste take you straight to Key West! Super easy, right? As you can see this no-bake key lime pie recipe contains raw eggs…I told you it was old school! If you’re concerned about salmonella I recommend either baking the cake for 15 minutes at 350 before refrigerating or heating the egg yolks slowly to 160 degrees in the lime juice prior to beating (per the USDA website.) You can also use a pasteurized egg substitute in place of the raw eggs. Simply use an egg white substitute for the whites and 1/2 cup Egg Beaters for the three egg yolks. I’m a rebel and go full raw just like with my caesar dressing but it’s a personal decision-do what you’re comfortable with!! 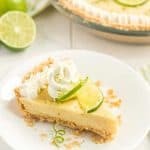 Can I Use Regular Limes in Key Lime Pie? I highly recommend NOT using regular lime juice in Key Lime Pie. Persian limes and Tahitian limes do not have the same characteristic tart Key Lime taste. If you cannot find Key Limes in your grocery store, use the bottled key lime juice I mentioned earlier. I have another key lime inspired recipe for you coming up in a couple weeks that I made the same day. And that key lime pie-gone in a flash! I finished off the last piece yesterday after a particularly rough batch of traffic coupled with coming home to a dog with some tummy problems if you catch my drift. It was enough to make me forget my troubles for a few minutes! What is your favorite summer pie? 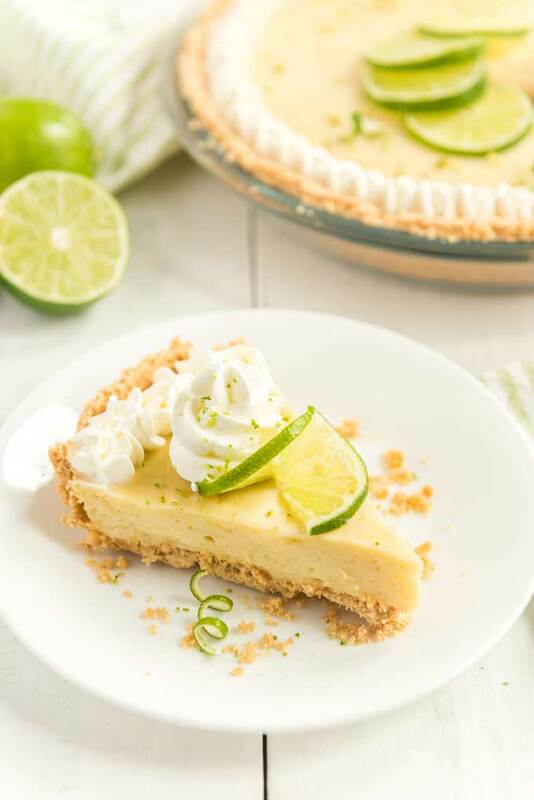 Have you made key lime pie before? Do you bake it or go no bake? 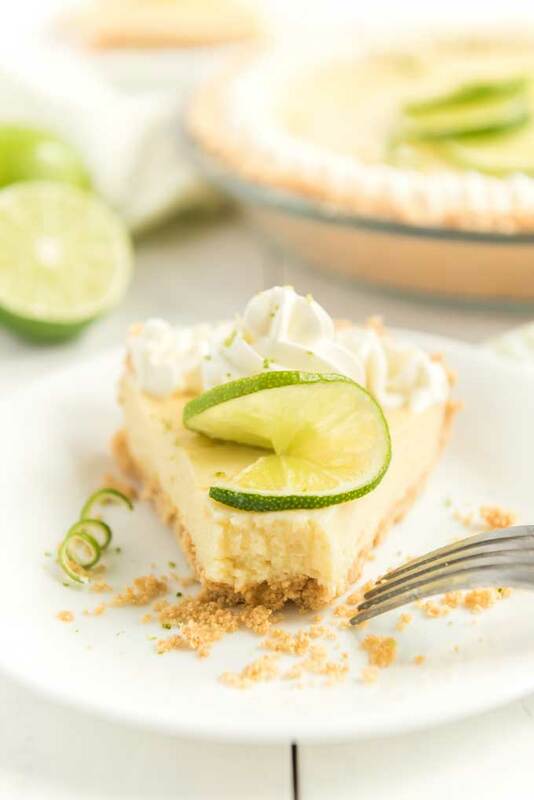 This traditional no bake key lime pie comines the perfect blend of sweetness and tart flavors that Key Lime Pie is known for! The perfect summer dessert! Dissolve the gelatin and lime juice over low heat in a small saucepan, set aside to cool. Beat egg yolks until a pale lemon color, then add 1/2 tbsp sugar and continue to mix until blended well. Add condensed milk and beat 2 minutes. In a separate bowl beat egg whites and 1/2 tbsp sugar until stiff. Fold together the two egg mixtures and lime mixture and pour into pie shell. To avoid using raw eggs substitute pasteurized egg products instead. Use 3 tablespoons pasteurized egg whites for the egg whites and 1/2 cup pasteurized egg substitute for the yolks. For more yummy pies, check out these recipes! I love key lime pie but haven’t made it in forever.That needs to change quickly! Love your recipe! I’ve never tried that version Cassie, I’ll have to give it a shot next time! This turned out like a dream!! I’d give it more stars if I could!